I took my aunt, uncle, family friend, and sister out to a Jamaican restaurant after window shopping at East Palo Alto IKEA. In addition to the jerk chicken, we had Back-A-Yard’s corn festivals. 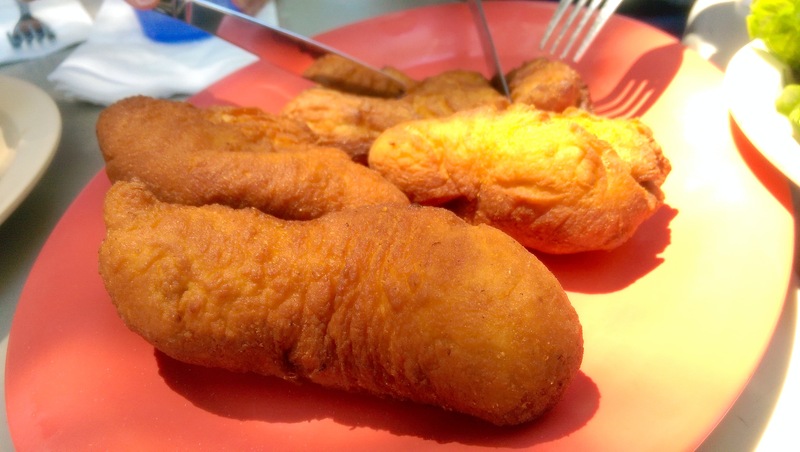 They’re also known as Jamaican fried dumplings, fried dough, cornbread fritters, or fried cornbread. In Jamaica, they’re simply known as festival. They’re best eaten right after it’s made, while still hot. Recipes can be found throughout the internet, and it looks like the primary ingredients are cornmeal, all-purpose flour, baking powder, sugar, salt, and oil. Slightly sweet and very moreish fried dumplings, called festival, from Jamaica, these are traditionally served with jerk meats. According to legend these light Jamaican corn bread fritters got their name because eating them is fun—like a festival.